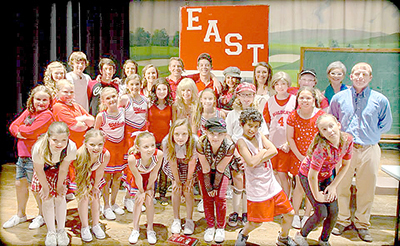 Pictured are students of a previous production from Bevill State’s Summer Theatre Camp. Athletic Arts Director Maria Ross and BSCC Jasper Campus Dean Penne Mott expect camp registration to be at full capacity. The Athletic Arts Center and Bevill State Community College are gearing up for their annual Summer Theatre Camp, open to third graders through seniors. According to Maria Ross, the owner and director of the Athletic Arts Center, the camp always serves as an avenue for students to explore their bravery and prepare for the pursuit of performing arts at the next level. She says roles are available for young children to late teens, and youth are welcome from all experience levels. There are also internships available for older students, giving those with more experience an opportunity to help their younger peers. Penne Mott, the Dean of Health Sciences and Jasper Campus Administration at Bevill State, says the program isn’t only beneficial to actors, there’s also valuable production insight. “It’s not just a performance. ... They also learn about costume, set development and things like that. It’s an all around theatre perspective,” she said. Mott also said it’s one of few opportunities for children to gain theatrical arts exposure in the county, unless their school has a theatre program. A number of organizations come together to fund the camp each year, and Ross says she feels “fortunate” that others are invested in the availability of arts education in the county. “It’s high quality, it’s great instruction. It’s great performance, and so for a small community to come together and do that, I think the kids are very fortunate,” Ross said. The children who participate in the camp will give three performances this year, one on Friday, June 26, at 7 p.m., and one the following day at 2 p.m. Both performances will be held at Rowland Auditorium in Jasper. The group will perform a third time for other children participating in summer programs throughout the county. Camp students will meet each week, Monday through Thursday, from 9 a.m. to 3 p.m. There is a $400 registration fee for the program, and space is limited. Around 30 students will participate in this year’s camp, and scholarships for camp tuition are available. To register or for more information on financial aid and the camp schedule, visit www.bscc.edu, www.athleticartsctr.com or call (205) 387-9337. “It’s an invaluable experience, especially if they want to pursue theatre after high school,” Mott said.